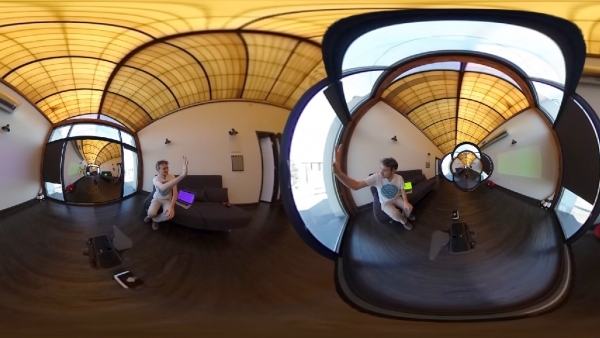 This is the equirectangular, "unwrapped" version of a spherical video. It can also be seen in the "in-sphere" view on YouTube. Using Möbius transformations applied to the Riemann sphere, one can produce a zoom-like effect. Zooming is used in flat media to make "Droste effect" images: images that contain a smaller copy of themselves. In this spherical video we do the same, adding the extra feature that the zoomed copies of each frame are offset in time. We slowly zoom from one copy of the scene into the "smaller" copy. The duration of the time offset matches the flight time of the camera; thus the video loops.